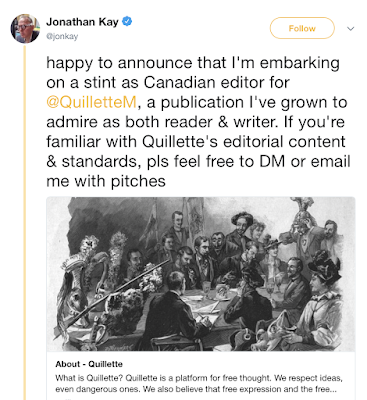 Jonathan Kay was once an admirable journalist, but has been going downhill for the past year or so and now appears to have hit rock-bottom - he's decided to declare his total allegiance to the alt-right by becoming the editor of Quillette. 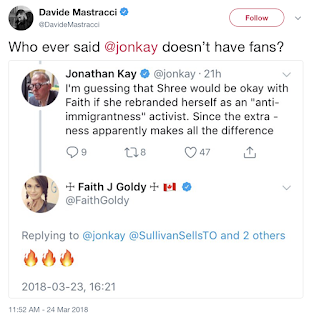 Jonathan Kay once ghost-wrote for Justin Trudeau. Now he's pals with former associates of Ezra Levant, the obsessed and conflicted arch-enemy of Justin Trudeau. How sad. But o my prophetic soul: I was just speculating yesterday that Quillette might be the beneficiary of Koch brothers money - this adds even more to the likelihood that Quillette is getting wing nut welfare, if not from the Kochs then from some other right-wing plutocrats. Kay's star is descending, but he at least has had an actual career unlike the usual grad students and alt-right extremists and Koch brother hacks like Jonny Anomly who normally contribute to Quillette. 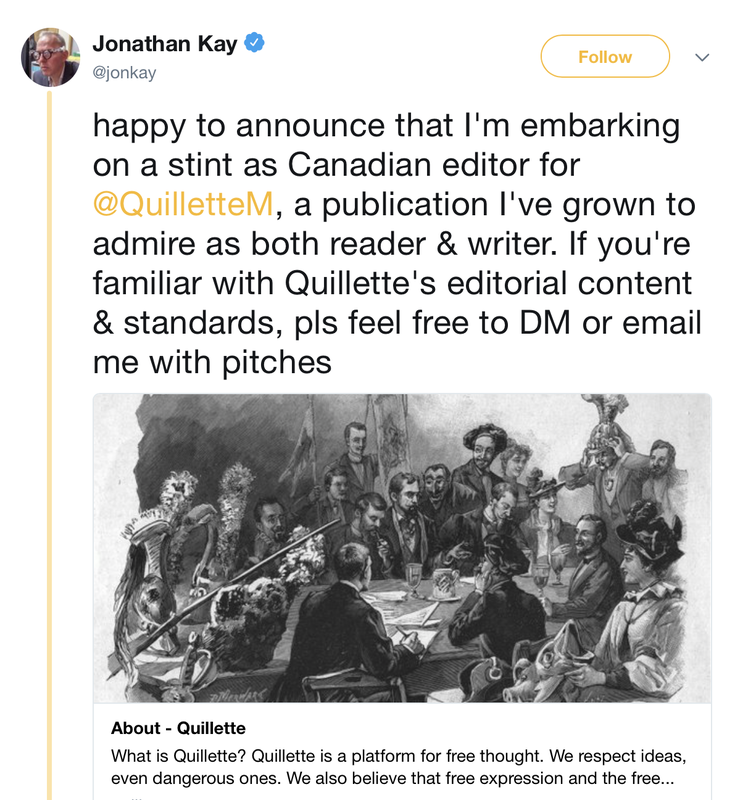 I assume Quillette has to pay real money for Kay, although I assume the gig will be part-time. Kay has already contributed to Quillette as a writer, and he's really the perfect editor for a rag with such flimsy journalistic ethics. At Quillette they censor critics while shamelessly proclaiming: Quillette is a platform for free thought. We respect ideas, even dangerous ones. We also believe that free expression and the free exchange of ideas help human societies flourish and progress." What a sleazy & demonstrable lie. But Jonathan Kay will go one step further - if he disagrees with you he will literally suggest you are insane. That's what Quillette means by the "free exchange of ideas." 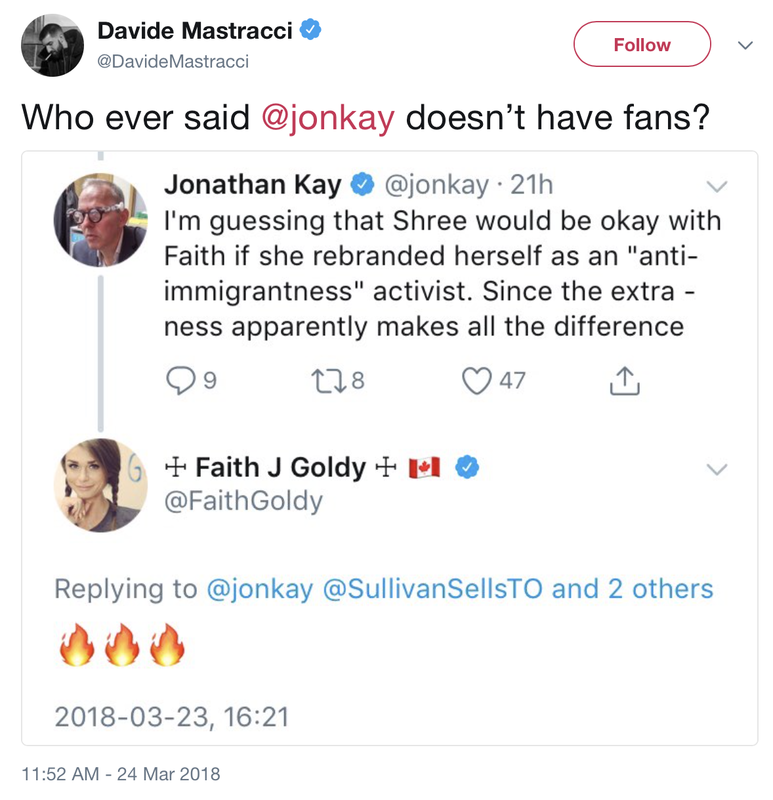 But then Jonathan Kay knows who his real audience is.